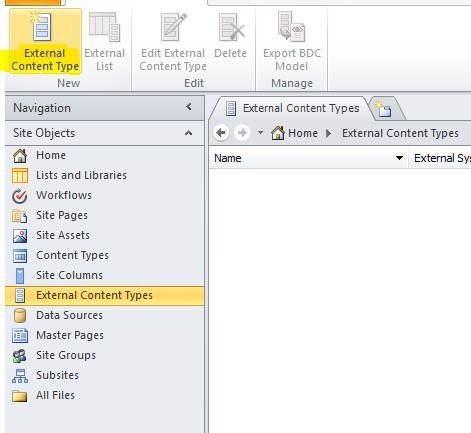 In this article we can explore how to configure BCS External Content Type in SharePoint 2013. BCS (Business Connectivity Services) allows Interfacing to Data that does not Live in SharePoint. For example, we can connect to External Databases, OData Sources etc. · To leverage an existing SQL Server Table containing Data. BCS would free us from duplicating the Table in SharePoint. BCS also saves the cost involved in Synchronizing Data if there are users working on updating the source table. 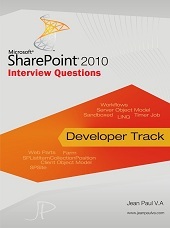 · In Internal SharePoint application requiring data from External application. In this case we can create Custom .Net BCS Providers. In our example we are creating a BCS List pointing to SQL Server Table. Please follow the steps below to create the BCS List in SharePoint. After the List creation, you will be able to Add/Edit/Delete items in the List & everything will reflect back in the SQL Server Table. Create a new SQL Server table named Customer. Fill the Table with some data as shown below. 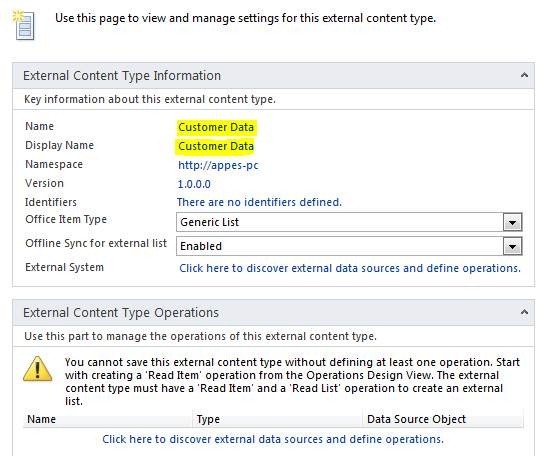 Open SharePoint Designer 2013 & Go to External Content Types pane as shown below. 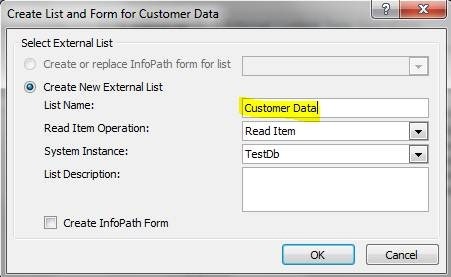 Enter the Name for the Content Type and click the highlighted area below to configure External Data Source. You will get the following dialog. Choose Add Connection option. In the appearing dialog choose SQL Server. Enter the Credentials to SQL Server. Choose our table. Right click and choose Create All Operations. You will get the following wizard. Click Next with default values. Now we need to create the List Instance. Go to Lists and Libraries in Designer and click the External List ribbon item. Choose our Content Type from the appearing dialog box. Click OK to continue. Enter the name as Customers for the list. Now you have successfully created the List Instance of our External Content Type. Now we can Test our new List. Open SharePoint & You should be able to see the Customers list in the Quick Launch. Click on it to see the items below. 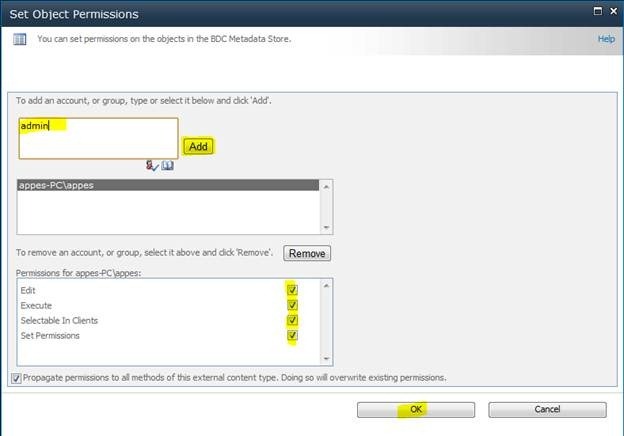 Once you can see the data like above – You have successfully configured BCS External Content Type. It is not surprising that you may get the following errors. You can refer the associated links to resolve them. In this article we have explored how to configure BCS External Content Type in SharePoint 2013. Message from External System: ‘Login failed for user ‘NT AUTHORITYANONYMOUS LOGON’.’. Open SharePoint Designer. Go to External Content Types > Open BCS item > Click Connection Properties button. Choose the Authentication Mode as BDC Identity as shown below. Save changes & Retry opening your BCS List. In this post we can examine a common error while configuring BCS for SharePoint 2013. You need to update the property RevertToSelfAllowed at Service Application level. You can use PowerShell to update this. Now retry opening your BCS List. The error should disappear. Following are the activities involved. Now we can create an External Content type using SharePoint Designer. Start the Designer application and open our SharePoint web site > External Content Types as shown below. Click on the External Content Type button from the top side. In the appearing window change the Name and Display Name (click on the links) as shown below. Now click on the External System link and you will get the following dialog. 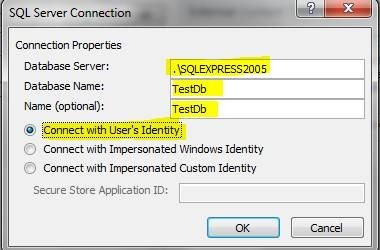 Click on the Add Connection button and select SQL Server in the appearing dialog. In the appearing connection details dialog, enter your server details. Click the OK button and your server connection is ready. From the appearing tables list select the Customer table and right click to get the context menu. 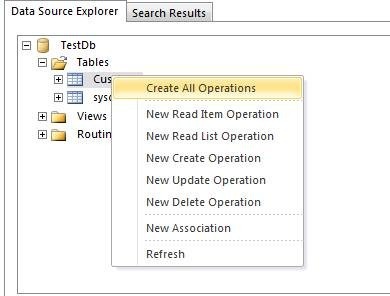 Use the Create All Operations menu item to get the Add/Edit/Delete operations wizard. Click on the Finish button in the appearing wizard. Click on the Save button from the top tool bar. Now the operations are ready and we need to create the List Form and the associated Add/Edit/Delete forms inside SharePoint. From the toolbar, click on the Create Lists & Form button as highlighted above. In the appearing dialog box enter the name for the List and click the OK button as shown below. Wait for a while and your List page will be ready. Now you can try viewing the Customer Data list inside SharePoint. On clicking the list, you will be seeing an “Access Denied by Business Data Connectivity” error message. To resolve this we need to set permission for the External Content Type. Open the SharePoint Central Administration website. Click on Manage Service Applicatoins. In the appearing list, hover over the Customer Data item and click on the Set Permissions menu item as shown below. You will get the following dialog. Now you are ready with the Permissions. 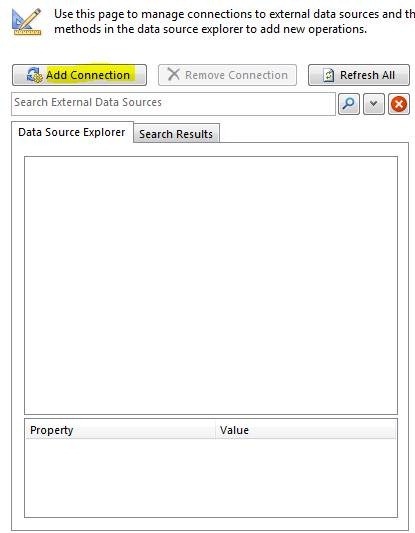 Go back to the SharePoint > Customer Data list and you will be able to see the data as shown below. Now you can try playing with the View/Edit/Delete features of the BCS list. In this article we have seen how to create an External Content Type through Business Connectivity Services and view it inside SharePoint. In the real world scenario using BCS we can connect to WCF Services and other Business Applications like Microsoft CRM to view/update data inside SharePoint.